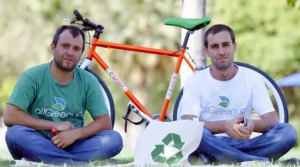 allGreenup, an application created by Chilean entrepreneurs to educate and incentivize users to track and reduce their carbon footprint, has reached nearly 25,000 social followers. The application offers prizes to motivate users to lead an environmentally-conscious lifestyle. For companies, allGreenup provides the missing tools and necessary incentives for them to fully integrate sustainability into their business models. Through the application, companies and individual employees are able to measure their impact and recycle their old habits into new, sustainable ones.